I’m so grateful to whomever thought of the idea of these Bubble Up casseroles creations. I’ve made some fantastic meals with just a simple can of biscuits as a start! 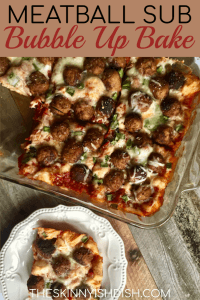 This Meatball Sub Bubble Up Bake is a delicious and healthy alternative to a regular ol’ Meatball Sub. It takes just a little prepwork and you’re totally good to go. I don’t know about you, but I love meatball subs. The toasted kind that are oozing cheesy goodness with a fresh baked bun are the absolute BEST! However, they’re usually not so friendly when you are watching your weight. One day I was having a food craving, which happens so often. I’m constantly trying to create healthier delicious foods, because when you’re on a weight loss journey, you can get bored really quick… I know I do. I’ve been on Weight Watchers for six months now, and I can honestly say I have never felt deprived. And because I’ve made changes to some of my all-time favorite, not-so-calorie-friendly foods that changed them into something completely healthy, I don’t even need that many “cheat meals” (except for Holidays and vacations, of course). I’ve tweaked this recipe a few times. One reason being the first time I did it I used Aldi Fit & Active Turkey Meatballs, which were low in calories/points. However, I noticed that some people didn’t have access to an Aldi, or their local Aldi didn’t carry them. I definitely didn’t want to make this such a limited recipe, so I came up with a Mini Turkey Meatball Recipe to go along with it. 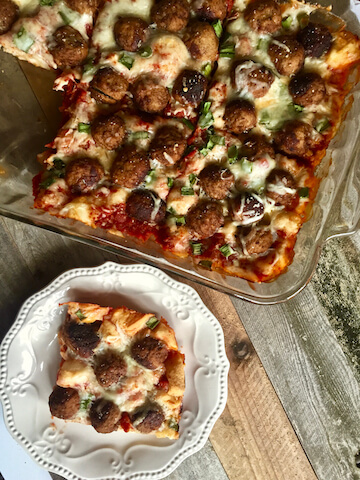 One of my favorite things about this- Using my Homemade Turkey Meatball Recipe, the points/calories per slice of Meatball Sub Bubble Up came out even lower and much more delicious. Gotta love that! The homemade turkey meatballs are absolutely delicious, and have much more flavor than store-bought varieties. Lightly spray a 9x13 casserole dish with cooking spray. Set aside. In a large bowl, Add all of the ingredients for your turkey meatballs, except for the olive oil. I'm sorry if you hate this part, but (with clean hands) get mashing! Make sure ingredients are combined well. After thoroughly mixing, roll your meat mixture into about 1/2 inch balls. You should get about 25 meatballs. A couple more or less is just fine. Turn them every so often so they are browned on all sides. Cook for about 8 minutes. While the meatballs are cooking, cut up your biscuits and add them to the casserole dish. Pour sauce over the biscuits. When the meatballs are done cooking, add them one by one so they are evenly proportioned throughout the dish. Top with shredded mozzarella and green onions. This is a great recipe! I made your Crockpot Marinara Sauce and then saw this recipe using it and I made both in the same day! I cheated and used Trader Joe’s Turkey Meatballs. They were huge, so I cut them into quarters. The grocery store didn’t have the small can of Pillsbury biscuits, so I bought some no name brand of home style biscuit as they didn’t have buttermilk in the 7.5 oz can. My substitute didn’t “bubble upl! It was still an awesome dinner, it was just little dough balls in the bottom. My family still loved it, so I’ll try it again with Pillsbury biscuits and maybe make my own meatballs! Any suggestions on how to disguise the zucchini in the meatballs? My teenage sons are BEYOND PICKY. Shredded/grated zucchini disguises super well! Very good , but my biscuits didn’t rise like yours…ever have that happen? Maybe I should bake it for a few min first next time? Thanks!! Hi! Question…when you say ground turkey, do you mean breast? Because what I found as lean ground turkey was 93%/7%. Which I calculated with the recipe builder at 15 points! Which makes the recipe 9 points per serving :-/ Still tastes amazing, but that’s a huge difference. Hi Gigi! In most of my recipes I use lean ground turkey (93/7), but this recipe does actually call for the extra lean ground turkey breast (99% fat free) so that I am able to keep the points lower. I’m sorry about that confusion, but I’m glad you enjoyed! Jennie-O makes an extra lean ground turkey that I’ve found to be pretty yummy and at most stores around me! For the meatballs- when you say extra lean ground turkey do you mean 99% lean? Hi! 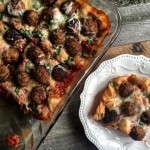 Could I Place the meatballs is the oven instead of frying them? I made this recipe & your marinara sauce recipe last week. Sooooooooooooo delicious and tons of flavour. I was down -1.7 at my weigh in on Saturday and I want to thank you and your delicious & easy recipes for that. Thank you for doing what you do! Love this recipe! Is it 16 or 32 oz of sauce? Your answer above was a bit ambiguous to me and the recipe still has 2c or 32 oz and I’m just wondering? I made it with 2 c last time and it didn’t look at all like your picture so I’m guessing doubling the crockpot marinara would solve that? so happy you enjoyed it! I realized I had never updated this recipe to say 4 cups of the homemade marinara. Sorry bout that! If I am using frozen meatballs that have been defrosted do I need to bake or brown them first? Or can I just throw them in? I tried the meatball sub bubble up last night and loved it!! Very tasty!! Thank-you. The only thing that I am not sure went as planned was that the dough didn’t seem to fluff up much. I actually reminded me a little of gnocchi lol I used Pillsbury country biscuits (I’m in Canada) but the weren’t buttermilk. Maybe that made the difference? love this recipe and can’t wait to try it, however can you clarify on the biscuits? I bought biscuits that have 6 points each. I know this can’t work with what you’ve written and I don’t know what you mean when you say they come in 4 packs…4 biscuits in a package or 4 tubes of 6 biscuits? They are smaller biscuits. They come in a 7.5 ounce and usually in four packs. 10 biscuits to each can. Pillsbury makes them, Great Value Brand, Kroger Brand, Aldi Brand. You can also take the regular sized butter milk refrigerated biscuits and cut into pieces. They have more points, but you can weigh out 7.5 ounces and it’ll be less. I’ll try to get a photo posted! I’m sorry bout that. Not sure why that happened. I haven’t seen anyone have that problem before. Oven times can vary a bit, maybe it just needed a bit longer in the oven. Hi there! Sorry I am just seeing this. It sounds like you got a regular can of biscuits which TOTALLY works, but the points/calories will be different. You cut each biscuit into 6 pieces so cut down the middle and then two times across and lay them out evenly in the pan. This looks so delish. I would like to add onions and mushrooms to the pizza. Have you tried adding more veggies to the pizza? Would this change the points and the recipe cooking time. I feel dumb asking this. We just left the grocery store. The only Pilsburt biscuits I saw that said “buttermilk” are the grands southern homestyle and it’s a 16.3 oz can not the 17 oz. It’s got 8 muffins and each rings in at 6sp EACH. Are these the right ones? That seems awfully high in points so I’m worried I got the wrong ones? Also do I use ALL 8 biscuits for the recipe? Thanks! Hi Christy! So sorry about that. I just changed the ingredients. It’s supposed to read as One 7.5 oz can of buttermilk biscuits, but the way my new recipe lay out is done makes it look like 17 ounces. Go ahead and just weigh out 7.5 ounces and use that. It should be about the same calories/points by doing that. Did anyone have trouble with the biscuits not cooking? I used a glass bottom dish which I’m wondering could be the issue. Otherwise this was great but I ended up cooking it for 50. Mins and still not cooked in the middle. Any tips/thoughts? I use a glass baking dish and I’ve never had an issue with baking the biscuits. Sorry to hear that happened! I had to chime in here. Biscuits or dumplings don’t cook properly unless all liquids they bakeor simmer in are hot. If the biscuits aren’t cooking and fluffing up, I bet it is because the sauce you poured on them was not piping hot. In that event, they sit there in lukewarm sauce until the oven heats up to temp and also heats the stuff in the dish. I’d heat my sauce. If it’s homemade marinara, reheat it until it is piping hot. Make sure your meatballs are also fresh from the skillet or kept warm. Just a thought. I haven’t made this yet, but my niece did, and she had no problems. I gave a five star based on my niece’s reviews, and others in my family are also raving about it. p.s. This past weekend I made so many of your recipes: Freezer Friendly Breakfast Sandwiches, Pepperoni Pizza Sandwiches, Biscuits and Gravy, Marinara Sauce and Crockpot Lasagna. O*M*G* they were freaking amazing!!! I have currently lost 15.4 pounds on WW and I owe so much to you and your wonderful recipes. I was truly blessed to find your blog! Thank you for all you do for us. Oh, I am so happy you’re enjoying all the recipes! and Good job on losing 15.4 lbs. Such an accomplishment. Very, very glad to hear that my recipes have played a part in your journey. I’ve never baked these specific meatballs in the oven, BUT I’ve made many meatballs in the oven. Place them on a sheet pan (line with foil for less mess) They should only take about 20-23 minutes at 400 degrees! Thank you for all the kind words! Have you ever tried baking your meatballs in the oven vs. pan frying them? If so, what temperature and for how long? I’m always looking for an easier out. I hate standing there turning and turning the meatballs…LOL Thank you. p.s. This past weekend I made your Freezer Friendly Breakfast Sandwiches, Pepperoni Pizza Sandwiches, Buffalo Chicken Dip, Marinara Sauce, Biscuits and Gravy breakfast and your Crockpot lasagna. O*M*G* Every stinking recipe was amazing!!! I am so blessed to have found you. I have lost 15.4 lbs. so far on WW and I owe so much to your fantastic recipes. You are a true blessing. Ahh! What a winner! After an epic fail on my part with your loaded chicken bubble up bake, I decided to give this a try. It was delicious! What a wonderful make ahead meal. I used 2.5 cups sauce because i didn’t want to leave a half cup unused in the jar.. and i baked it 45mins. Otherwise I followed your instructions exactly. No one could tell there was zucchini in the meatballs. What a cool way to plump up a meatball and keep it moist! Thanks! I’m so sorry you had a fail with the chicken bubble up, but I am so happy you enjoyed this one. Such a favorite around here! I made this for Super Bowl. It was delicious. You’re welcome, Thank you for enjoying them! Can i leave out zucchini in meatballs? You sure can. I’ve made them a couple times without because I just forgot to grab them at the store. It’s just a sneaky way to add a bit more nutrients to the meatballs and adds the tiniest bit of moisture! I thought this was outstanding!! Such a filling, comforting meal! I used lean ground beef. Do I toast or cook the biscuits before pouring sauce into if the biscuit pieces? My biscuits tasted like gnocchi in this dish! My husband & I enjoyed the casserole so much, thank you for the recipe! I personally don’t and they are cooked for me, but you can for sure put just the cut-up biscuits into the oven before adding sauce and meatballs to get them a bit more cooked up! I’d say maybe 4-5 minutes should do that trick. So happy you enjoyed it, Nancy! Awe thank you!! I am so happy you enjoyed it. It’s a favorite in this house, FOR SURE! Let me know when y’all try other recipes out!! Omg Star! This was such a hit tonight in our house. I made your crockpot marinara and then when my husband got home we rolled up the meatballs together. SO yummy! We both loved it and felt very satisfied. I am newer to ww so I have a lot of daily points. I changed the serving size in the recipe builder to 4 servings at 13 SP per serving. So yummy! Thank you for a great recipe; we have loved making your dishes. so very happy you enjoyed this! it’s a serious family favorite here too! Online grocery shopping now…quick question, hopefully you know! Is Part skim mozzarella cheese the same as 2%? Bubble-ups are the best and this is a regular for me. I make it with your marinara sauce too. I really like that I can eat a good size portion for low points. Thank you! This is also one of my favorite bubble up recipes! I’m so happy you enjoy! You’re welcome. This one is onvi a favorite! It’s actually the BEST! Yum! Top 8 without a doubt! Yes!!! It made it in there, no worries! I think I’m going to have a Top 8 Week of cooking soon! Did you use the whole package of aldi turkey meatballs? Looking to use them as a time saver…are the smart points the same if you use them? Thanks! Hi Lori! Gosh, I haven’t used it with the Aldi turkey meatballs in such a long time now because my Aldi stopped carrying them! (grumble) BUT I looked back on photographs from when I did use those meatballs and it was 30 meatballs =) I THINK it also made each slice one point higher. I hope you enjoy! I can’t wait to try this, but I have one quick question. You say to use 2 cups of your homemade sauce (which I can’t wait to make!) or one 32 oz. jar sauce. So, my question – 2 cups = 16 oz. Why does the recipe call for such a different amount of sauce? I plan to make your sauce, but not sure if I should really only use 16 oz for this recipe or 32 oz? Just a little confused. Thanks for the recipes and help! You are SO right. I don’t know why I only use two cups of my homemade sauce vs just matching it up with how much the jarred sauce has! I need to change this in the recipe! Thank you! I hope you enjoy this and the marinara when you make it! Thank you for the recipe(s) I made the meatballs & the marinara sauce too. It was great to make a WW recipes that everyone was able to enjoy! I must have over cooked the meatballs while I was browning them cuz they were a hair on the dry side. Live and learn! I loved the grated zucchini in the meatballs! Great idea! Nice way to get veggies in my kiddo. And I can’t thank you enough for the zero point marinara sauce! I used it on pizzas. Delicious! I didn’t think the one tube of biscuits was going to be enough but it totally worked! It is a great portion size for only 7 points!! Thank you! Will definitely make again!! Thanks so much for the positive feedback, Heather! I love that you made all three of the “mini” recipes to make the one big one! I’m also so glad you and your family enjoyed! And also, you’re very welcome! owning them cuz they were a hair on the dry side. Live and learn! I loved the grated zucchini in the meatballs! Great idea! Nice way to get veggies in my kiddo. And I can’t thank you enough for the zero point marinara sauce! I used it on pizzas. Delicious! I didn’t think the one tube of biscuits was going to be enough but it totally worked! It is a great portion size for 7 points!! Thank you! Will definitely make again!! Thank you for the wonderful recipe! (s) I made the meatballs & the marinara sauce too. It was so great to make something WW that everyone could enjoy! I think I overcooked the meatballs while browning them cuz they were a hair on the dry side. Live and learn! I loved the grated zucchini in the meatballs! Great idea! Nice way to get veggies in my kiddo. And I can’t thank you enough for the zero point marinara sauce! I used it on pizzas. Delicious! I didn’t think the one tube of biscuits was going to be enough but it totally worked! It is a great portion size for 7 points!! Thank you! Will definitely make again!! I’ve seen variations of this recipe and I’ve never made it before – I’m putting it on my to-do this! I love that the portions are so ample. I read recipes that call for an 8 inch square pan and it will say “serves 12 or 16” Nope! Your portion size was just right! What a good points deal! as you know, I LOVE FOOD! so I always make sure it’s at least 6 good sized portions! One and a half or two portions won’t even mess you up! Thanks for always giving me the best compliments. You are just fantastic! Is there a way I can pin this recipe? i just added the sharing buttons! This looks delish! Do you squeeze excess water out of the zucchini or no? Can’t wait to make it!